For a recent birthday getaway, the missus and I enjoyed a brief escape to the luxurious environs of the Park City Waldorf Astoria. While there, we visited Powder restaurant—an eatery that has had its ups and downs, including multiple changes of name, ownership and management. You might recall that the restaurant that is now Powder began its journey in 2009 at the (then) Dakota Mountain Lodge as Spruce, a spin-off of its well-respected San Francisco namesake. And it was good. In fact, it was great. But, before you could say "relocate," most of the kitchen and management staff who made Spruce so exceptional were shipped back to San Francisco, and things started to slide downhill at an alarming rate. The Dakota Mountain Lodge would become a Waldorf Astoria property, and there, Slopes restaurant was born, operated at the time by Talisker Mountain Inc. After a period of disappointing dining in that space—disappointing to me, at least—Slopes brought back excellence under Chef Clement Gelas, circa 2013. Then, the restaurant was again rebranded—this time as Powder—under Waldorf Astoria management. I'm happy to report that, today, Powder is firing on all cylinders. In fact, I think the current incarnation of the restaurant, with Chef Ryker Brown in the kitchen, is the best of them all. Dinner begins with complimentary bread (from Park City's Red Bicycle Breadworks) and accoutrements. We were thrilled to find that our server was one who had waited on us before, at Slopes. His name is Ian Buckingham, and although he's young, he seems to have a lifetime's worth of professional server savvy, including a very good knowledge of wines and other beverages. A Utah native, his father owned Moab's Buck's Grill House, where Buckingham started in the restaurant industry. Chef Brown works with Caputo's Market & Deli and artisan purveyors such as Cristiano Creminelli to select items for his artisanal cheese board ($19.75) and charcuterie board ($24.75), and either would be a great place to begin or end a Powder meal. The night I had dinner at Powder, we enjoyed a special soup that was incredible; I hope it finds its way onto the permanent menu. It was a creamy, luscious corn bisque made with fresh, sweet spring corn and corn "milk," along with potato wedges, zucchini slices and pancetta lardons. The corn-milk broth is poured into a bowl containing the other ingredients at the table, making for an enjoyable and interesting presentation. Up next was a refreshing salad from the spring/summer menu: an eye-popping, Technicolor arrangement of gold, purple and red baby heirloom beets served with cubes of compressed watermelon, Feta cheese squares, crumbled hazelnuts and fresh watercress, all drizzled with white balsamic vinegar ($15.50). What a beautiful and delicious summer salad! By the way, items like the beet salad are plenty large enough to share—and even better when paired with a glass of Leth Riesling from Austria. Another dish built to share is the tasty ahi tuna tataki ($19.75) appetizer. In Japan, tataki refers to foods—usually fish or meat—very briefly seared over high heat. And that's what Powder's tataki is: sushi-grade ahi tuna peppered and seared just long enough to create a crisp outer crust, with the interior of the tuna left essentially uncooked. The tuna is cut into squares and served with sliced radish, micro cilantro leaves, serrano pepper slices and a ginger-soy-lime vinaigrette. The slight sweetness of the ginger helps to balance the heat of the serranos, but the tuna itself is the real star of this excellent dish. Chef Brown and his staff enjoy the art of pairing wines with food, and offer special chef tasting menus with pairings. The tuna tataki, for example, was paired with an unexpected but exceptional partner: Veuve Clicquot Brut Champagne. I see a lot of fried chicken on high-end restaurant menus these days. It has made a comfort-food comeback, even in the classiest joints. Well, Chef Brown has kicked the fried-chicken concept up a few notches and created what might just be the planet's most elegant version ($36.25). Brown prepares his organic chicken sous vide for at least 24 hours, allowing it to cook completely through at low heat, thereby not losing any of the scrumptious juices within. He then batters the cooked chicken and deep-fries it, ever so briefly—just long enough to obtain a crisp, gorgeous crust. The chicken is so tender and juicy that it's almost astonishingly delicious, served with fresh corn kernels, sliced fennel, homemade pickles, squash, dill, ramps and a marvelous demi-glaze. I liked the chicken so much just as it was, that the demi-glaze sort of seemed like overkill, although it was still spectacular. A nice surprise was a suggested beverage pairing with the chicken of Epic Brewing Cross Fever Amber Ale, another spot-on partnership. 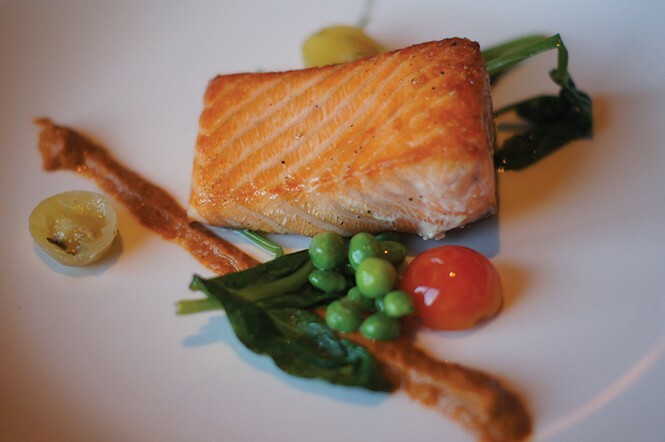 Other notable dishes included a beautifully cooked Loch Duart salmon fillet with a romesco sauce—an interesting idea—plus fresh English peas and marinated baby heirloom tomatoes ($38.75). And, turning to the sous-vide technique again, the "72-Hour Beef Short Rib" ($38.75) is remarkable. As the name suggests, the short rib undergoes three days of "slow-and-low" sous-vide cooking before it is seared to a nice crust and served with homemade mustard, grilled romaine and cipollini onions. The phrase "melt-in-the-mouth" could have been coined for this short rib. Finish up with an order of hot, sugar-dusted beignets with raspberry coulis and vanilla cream, and consider treating yourself to a room at the hotel. After all, such a splendid dinner at Powder should only be followed by even more Waldorf Astoria-style pampering.